All youth in grades 6 through 12 are invited to meet every Sunday after the 10 am service (around 11:15 am) in the youth loft. Each week features a Bible passage, discussion topics relevant to today’s youth, and an interactive element such as a game or speaker – plus delicious snacks. Each month also features an activity such as a service project (random acts of kindness, serving the homeless with Grate Patrol, assembling Comfort Cases for foster youth) or a fellowship event (autumn bonfire, bowling, and laser tag are favorites). Every few months, these events happen in conjunction with other Episcopal youth from the Central Montgomery County region. The Christ Church Youth Council, made up of five exemplary youth who meet with the youth minister each month, help plan these events and activities. 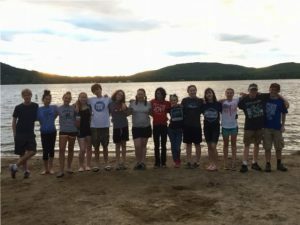 The youth group year culminates in a week-long summer mission trip. This event gives youth an opportunity to love our neighbors, practice being Christ’s light in the world, and have fun getting to know each other. Recent trips include Rutland, VT; Pine Ridge Reservation, SD; and West Virginia. This year’s trip was to Queens, New York, where participants engaged in ministry to the elderly, the homeless, and the children of New York City. For those who were baptized as infants and are in the 9th grade or above, confirmation offers a time and ritual to affirm their commitment to their journey of faith in the Christian tradition. Confirmands at Christ Church engage with a curriculum entitled Confirm Not Conform, which presents students with a comprehensive overview of the Episcopal Church and the core tenets of the faith, and encourages them to draw their own conclusions about their faith, beliefs, and values. Classes are typically small (3-5 people) and run for 4-5 months, culminating in an all-diocese confirmation service at the National Cathedral. To find out the latest and greatest, contact Youth Minister Madison Chase at youthminister@ccpk.org. We look forward to welcoming you in person!